It’s that time of year when most folks who have done teacher exchanges are winding up and getting ready to go home. I have been following a few friends in this process, and remembering our last weeks in Australia. It was an emotional time. We were very settled in our life in Newcastle, and saying goodbye was hard. The kids’ school sent them off in fashion, with a red and white day (instead of uniforms) and a special assembly where they sang O Canada and Advance Australia Fair. It was incredibly moving. Our homecoming was beautiful. My sister made sure of that. We felt so welcomed to be back. The kids were thrilled to run around the house and remember their rooms, their stuff, especially the toys. We fell back into routines with good friends. Life was returned close to what it had been. Yet, returning home has been a strange journey. I walked into my house and realized I didn’t live here for a year and someone else did. We found traces (actually, more like big reminders) of these people as we reacquainted ourselves with our home. I had to censor myself from saying “in Australia”, or “where the kids went to school”, etc. in every other sentence as I talked with my friends and family. I dealt with this mixed emotion of being at home especially when people would say “you must be happy to be home”. It’s not that I wasn’t happy, it’s just that I was grieving the loss of leaving a place where I also had been happy. I was still adjusting. It’s hard to explain and hard to understand unless you’ve been there. I realize that I have changed some and many of my friends have, too. It’s inevitable. We finally feel settled back into life in Vancouver. We would be lying if we didn’t say that we miss some of our life in Australia—oh, that sunny and warm weather! We think of friends often (especially you, Amanda and co!) and relish frequently in good memories which warm our hearts. Thank goodness for phones and technology to help us stay in touch. Someone posted there are one of 4 ‘–ates’ that exchangees do when they return home: separate, procreate, renovate, or relocate. None of those have applied to me (although I have considered a small reno or two, I have to admit), so I’ve added a fifth one—contemplate. I’ve returned with a different lens. My whole family has. We contemplate life in a new way because of our experience. The exchange gave me a beautiful opportunity to reflect upon so many things. I had to dig deep to flourish, especially when my dad passed away, and so did my children. We are stronger people because of that. Awareness comes out of contemplation. I have learned that I can feel at home in more than one place—most of it comes down to attitude and heart. For that, I feel grateful. And for the foresight my husband had to keep bringing up the exchange through his eternally optimistic view that it would all work out. Yes, honey, you were right. Happy holidays to all my friends and family here, in Australia and so many places around the world. May 2015 be full of adventures, happy memories and hope. A year ago today we arrived in Newcastle. The sun was shining and it was warm by our standards. Funny, it seems colder to me now. I guess I have acclimatized?! What a year it has been! We have been to Queensland, Victoria, ACT, New Zealand and of course, to many places in New South Wales. We’ve played cricket, netball, tennis, handball, tips (tag) and soccer, and had one surfing lesson. We learned more about footy, how to speak Australian, and about new flora and fauna (are spiders fauna??). We never did learn to like Vegemite, though. Bittersweet words as we never did see him again. But we had fun, learned and loved most things new. It does not make the sadness go away, and the tears flow as I think about not seeing him again. However, it is a constant reminder that being present is the most important thing in life. We got so much out of this exchange because we were able to do that more often than not. Thanks for the words of wisdom, dad. Seize the day, folks; life is meant to be lived. Sorry, no Aussie slang this post. It has begun. The first of the last things we’ll do in Australia. It seems like just a few months ago that we were doing all of our firsts. I cannot believe we’ve been here for almost a year. How time has flown! Today marks the last week of term and the last week both Mike and the boys will be at school. That means the last week of wearing uniforms, too! It will also be a week of last tennis practices/comps, last marking and teaching of Australian students, Scout meetings, skating coffee club meetings, soccer practices and assemblies. It is the beginning to the end of an incredible journey. In three weeks we leave Newcastle to begin our slow journey home. This does not mean it is the last time we’ll be in Australia. Nor the last time we see many of our friends. In fact, I think it marks another first. The first of many Australian goodbyes! Reef and Rainforest Part 2: The Rainforest! We arrived back in Cairns to a lovely evening, with beautiful lanterns lit up amongst the trees on the promenade. That made the walk back to the Rydges Esplanade easier to take (or maybe it was the treat meal at Macca’s??). The next day we made our way up to the Daintree area. We stopped in Port Douglas briefly—what a beautiful beach, with such warm water! We finally arrived at our bed and breakfast in the Daintree, which was also a zoo— such a highlight for the kids. They got to touch and feed the kangaroos/wallabies, who ran wild on the property and were our buddies on our way up to breakfast. They also had crocodiles, dingoes, a wombat, and a cassowary, which were not running wild, thankfully, and a bird section with owls, parrots, kookaburras, etc. 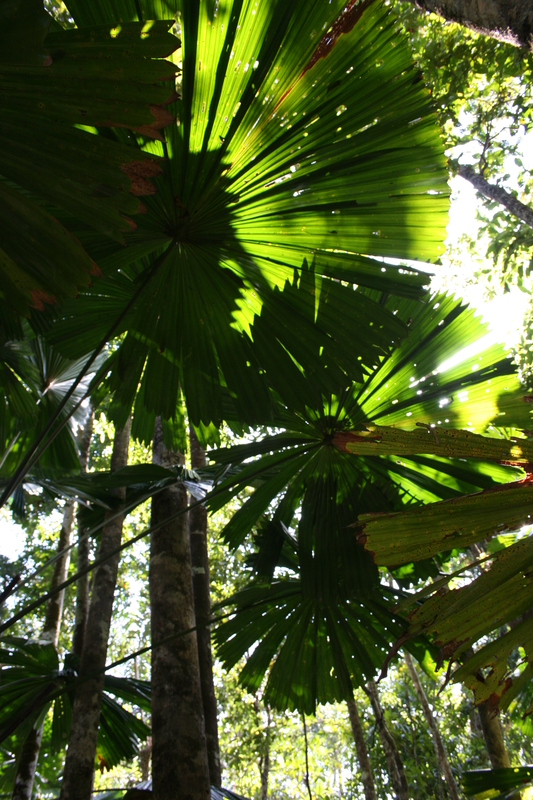 We drove up towards Cape Tribulation for a day, and enjoyed the rainforest. We opted not to pay for the Daintree Discovery Centre walks, and did our own (I know, we’re cheap. No wait, we’re just on a budget. Yeah, that’s it). Just down the road from the Centre are several great walks in the forest, some with boardwalks and one on a lovely trail. We saw amazing trees, plants, and flowers and swung off of strangler figs’ big tree branch vines. 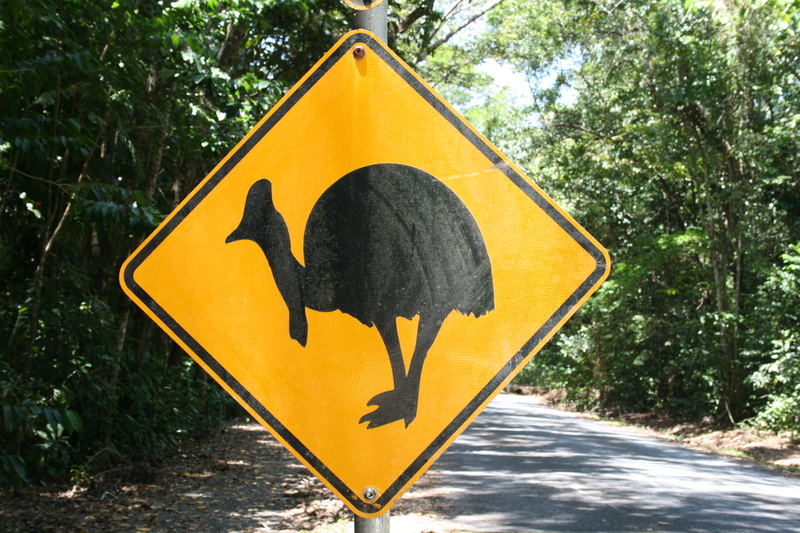 No Cassowary sightings. We were disappointed about that, but it might have been a good thing. They are large birds and have been known to attack if threatened! 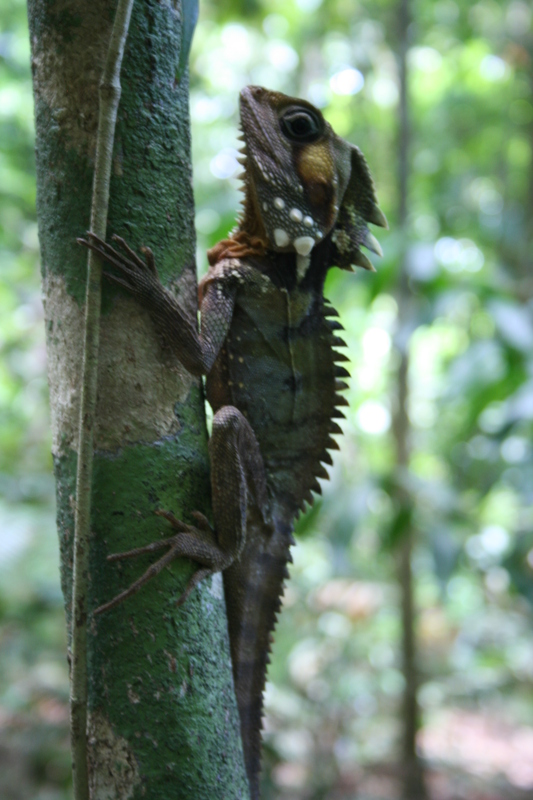 We did see a cool lizard, though. We went on several other walking tracks and enjoyed the mangroves, big ferns and other flora. Took a quick dip in the water by Cow Bay and Tobias had his first Huntsman spider sighting. On the back of the outhouse door! Poor kid, he still is traumatized, and won’t go into an outhouse or anything resembling one. We saw Cape Tribulation and I was able to take a trip down memory lane about my trip up here almost 20 years ago. Not that much has changed, really! The Bat House was closed when we got there—what a shame. I enjoyed feeding the rescued bats fruit when I was here last, and looked forward to showing the boys the centre. The Daintree is still one of my favourite parts of Oz. There’s something about the lush scenery being so close to the beaches that make it such a beautiful place to be. Ute: Utility vehicle. It is not, and I repeat, not, a truck! It does look like a large pick-up truck with a cargo trailer in the rear. 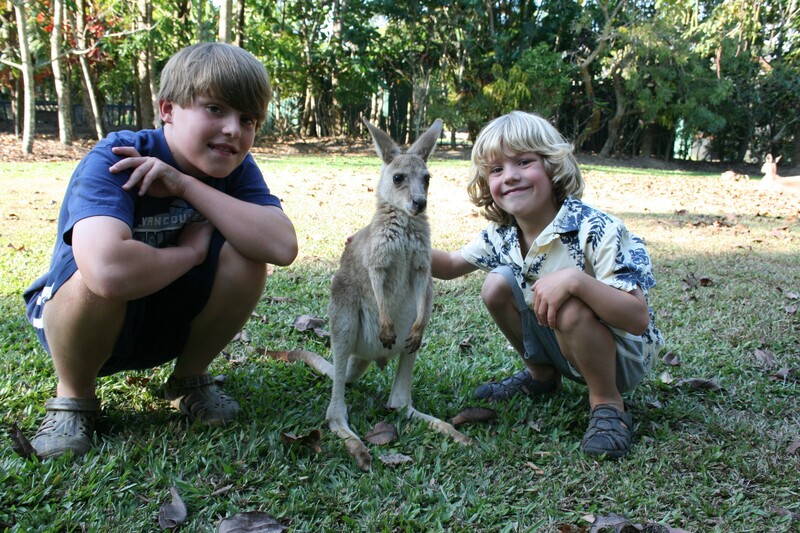 Waaay back when, in September 2013, we spent most of our first school holidays in the Cairns area of Northern Queensland. We chose to go at this time to avoid jellyfish season, typhoons and supreme humidity. Nevertheless, the heat and humidity hit us as soon as we came out of the airport, even at 7PM. The hotel hit the spot, though, with a cool-looking pool and tennis courts. We checked out the pool right away and Tobias and Mike even played a little tennis. We then ventured out to check out the night market and it was fun to see the kids get excited over buying their first Aussie souvenirs! After a big buffet breakfast, which we needed for our long, hot walk to the ferry terminal (note to self: make sure you calculate how far a walk with luggage is really going to be), our next stop was Fitzroy Island! We arrived at the resort, the only hotel on the island, to find out we had been “upgraded”! Yay! Hmm, not sure I would call it an upgrade–it was a few minutes closer to the beach but that was about it. So we downgraded and got our original room, which was much bigger, more luxurious and came with a real kitchen full of stainless appliances which we needed for all of the food we had schlepped along. 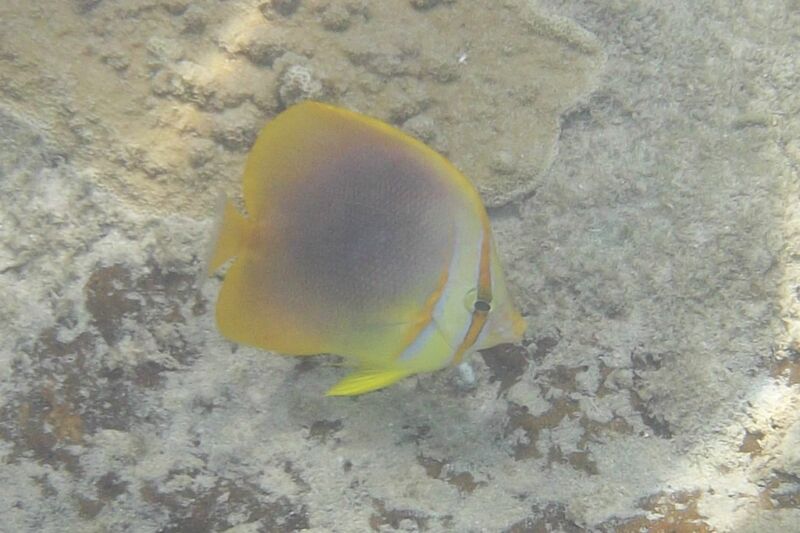 There was great snorkelling around the island. 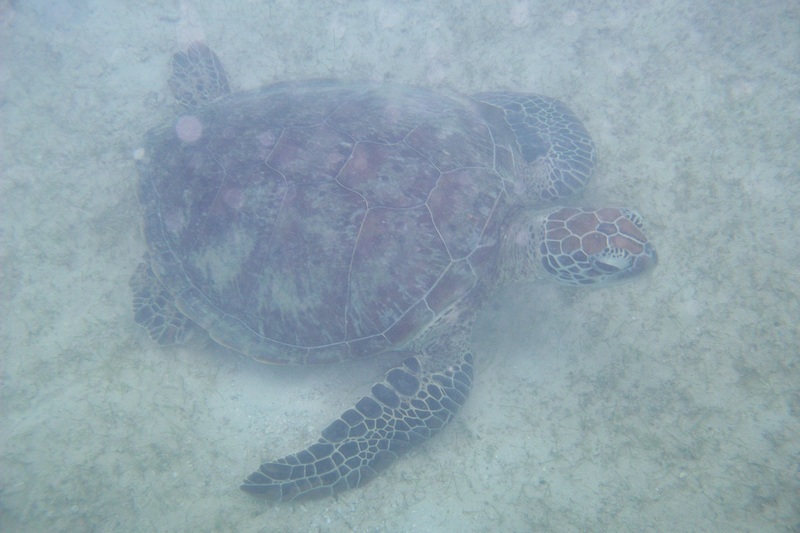 We saw turtles, beautiful coloured fish and coral, and I even swam close to a spotted stingray! It was great to see Tobias get over his fear and enjoy his first snorkelling adventures. Lukas preferred to dig on the beach and jump in the waves. We made the short trek down to Nudey’s Beach, and it was sooo worth it. Beautiful sand beach, cool snorkelling and fewer people. No, not naked people. We were sorry we didn’t check it out earlier. Even though it was pretty hot, we hiked up to the summit on the island (maybe we should have gotten up earlier?). It was a little hard on the boys going up, but they made it and then ran back down. 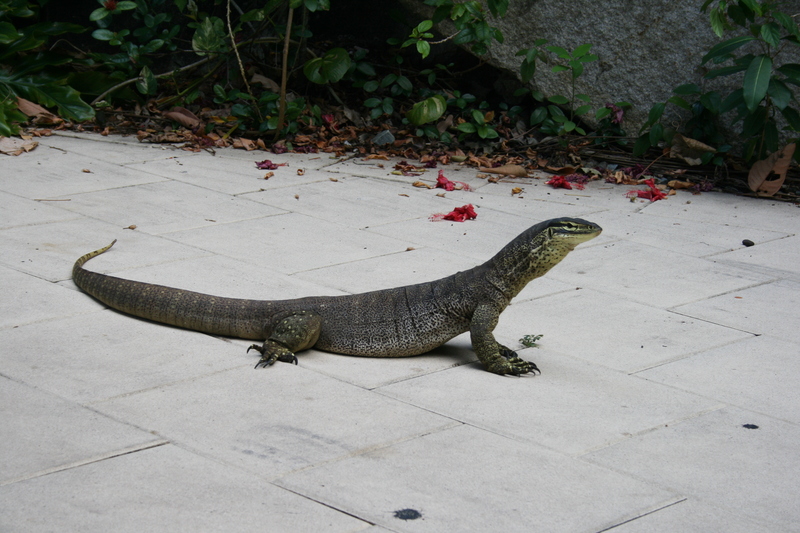 At the end of our trek, we ran into Gus, the big, local monitor lizard, as he sunned himself. We went on a glass bottom boat tour, which wasn’t really worth the money. It’s hard to look down for a long time on a boat—it makes you seasick! We cruised along the same spots where we had been snorkelling already, and didn’t even see some of the amazing things we saw. Having said that, it gave Lukas the chance to see blue coral and some cool fish, so we were happy about that. 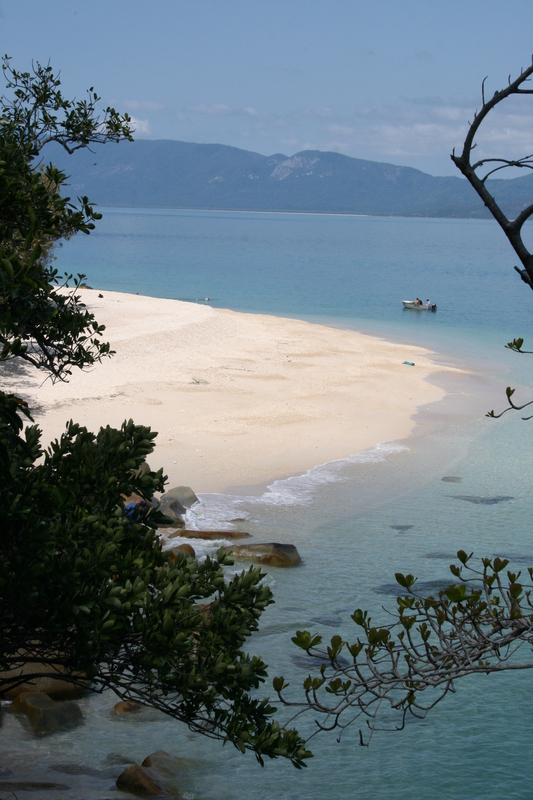 Overall, I would say our trip to Fitzroy Island was a success, in spite of the pricey hotel. 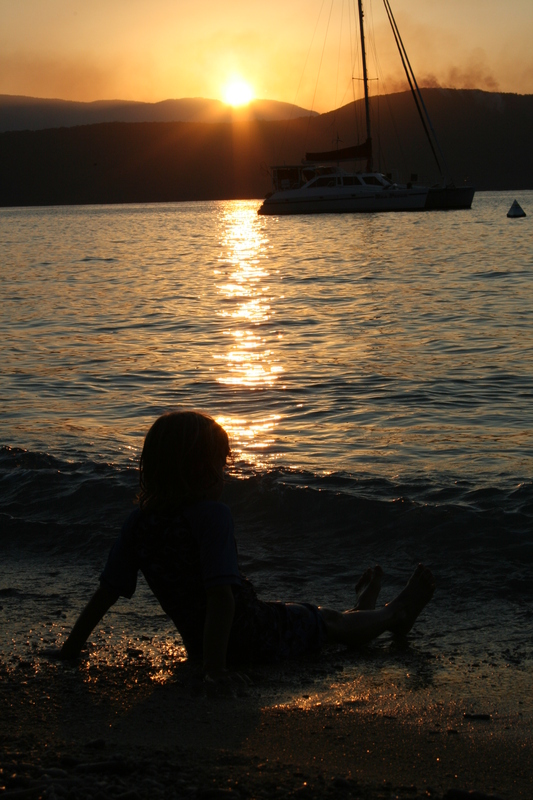 We saw beautiful sunsets, amazing underwater sights, I found heaps of sea glass hidden amongst the coral on one beach, and the kids loved the free movies and table tennis (as did Mike)! 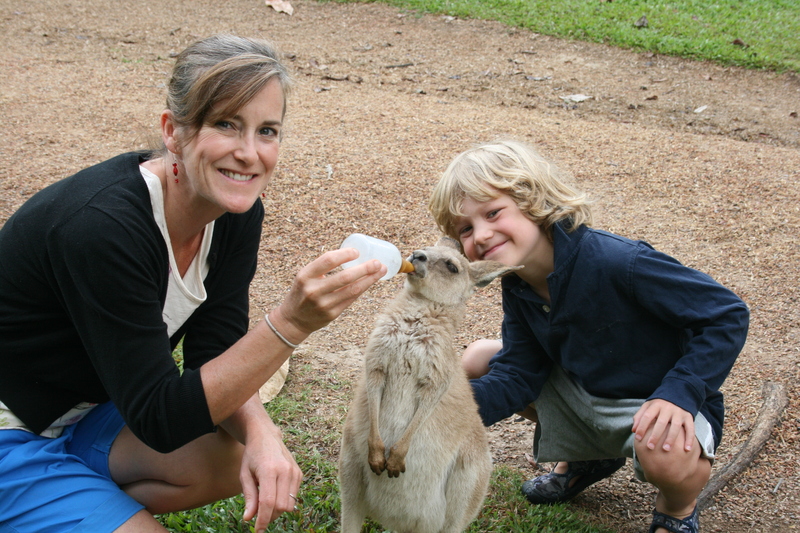 Deciding to do a teacher exchange in Australia is something one doesn’t make lightly. You weigh many different factors—how it will affect your children, your spouse, when to go, where to go, the financial aspects, etc. One factor can be the distance from friends and family, and many people consider the health of their parents or other relatives before they commit to an exchange. We got full and final confirmation of our exchange for July 2013 in March of 2013 (yes, it was a very short timeline!). Not long after that, my father began to experience some health problems. It didn’t seem too serious, more disconcerting than anything and the doctors were on top of it, so we elected to continue with the exchange. Then the unthinkable happened: my father became more seriously ill and passed away in April 2014. I returned to North America, along with my family, to pay my last respects and be with my mom and sisters. I had no option to return home in time to see him in person due to the distance. Sometimes I struggle with the guilt of coming here. The last time I saw my dad was at the airport in July. Had I still been at home in Vancouver over the past year, we all would have seen him again at least once, and I could have gone down to be with him and my mom when he was sick in the hospital. My boys could have had more time with him, with the Grandad they loved to play Monopoly and trains. I know that my dad would not want me to regret our decision. He loved to travel, to meet new people and discover what the world had to offer. When I was a kid, we moved from Montreal to St. Louis and lived there for 4 years before moving to Brussels, Belgium for 8 years. Those experiences shaped me positively, and contributed to our decision to take on the exchange. You could say it was in my blood. My dad wouldn’t have wanted it any other way and I know that my coming over here is more a testimony to him (and my mom) than anything. It’s too bad my heart and head can’t merge about that yet. Time will tell. My father’s passing does not detract from the experiences we have had or memories we have made here in Australia, and it won’t take away the friendships we have made. The support from our friends and colleagues here has been overwhelming, as it has been from all of our friends across the world. How lucky am I to be able to say that? I miss you like crazy dad. I only wish I could have seen you one more time, to give you a big hug and say thank you for everything. I am thankful that my sons and I had the chance to talk with you 3 days before you died. I am grateful that in my family, we always said I love you before we hung up the phone, so one of the last things I heard from you was that, and one of the last things we told you was the same. I love you, always will, dad, and as my younger son reminded us, you still love us too. 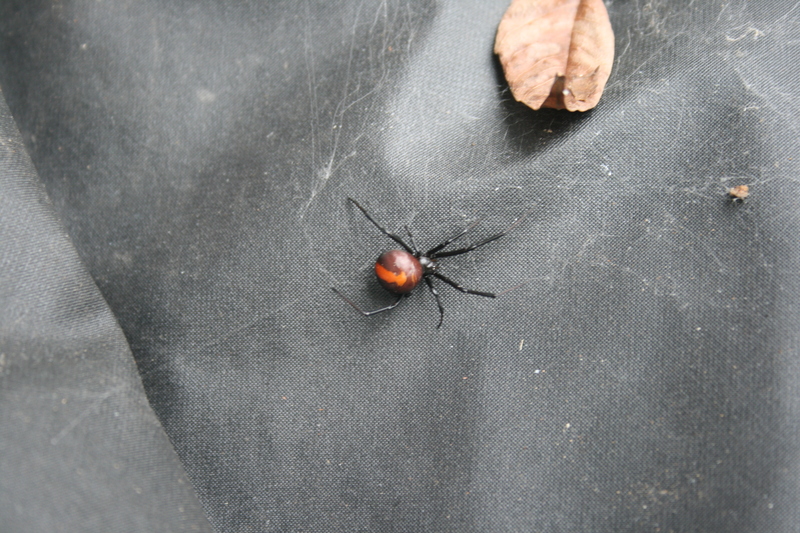 Aha, it finally happened, we found a redback spider close to home! She was hiding underneath a rattan chair in our yard, which had been overturned because it had gotten soaked in the rain. It was a good thing we did find her, as she had a whole bunch of babies in cocoons getting ready to hatch. Suffice it to say, she is no longer with us, and neither are her babies. We really didn’t want a family of redbacks living in the children’s play area. No, it wasn’t really that scary, more intriguing. Since then, we have found 2 more, which were both living in our BBQ cover. EWWW! 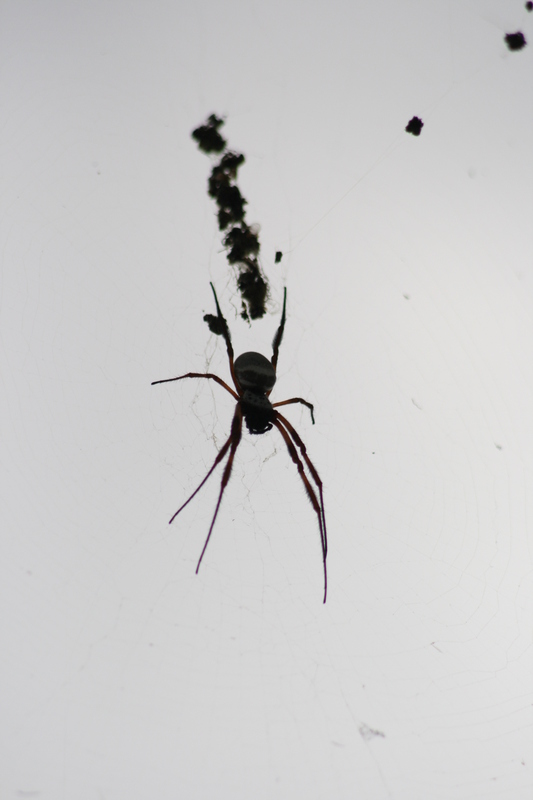 There are plenty of other outside spiders around, though. They are very quick to build webs around here. The only ones we have to deal with inside are the Daddy Long-Legs. They’re just annoying and make the corners of the house dirty, especially the ones I cannot reach! Ants: little lines of them in the bathroom, mudroom and kitchen. We even found a whole pile of them in a kitchen drawer, once. Yuck! Cockroaches: the best way to find them is to turn on the light in a room at night. They go scurrying, and still make us jump and squeal when they do. We’ve found them in the mudroom, living room, bedrooms, bathroom, and kitchen. Wait, that’s the whole house! So I guess that means we’ve found them everywhere. Now I’m not talking about an infestation, just the odd one every now and then (we are talking about a period of 8 ½ months here). The worst place we’ve found them has to be the dishwasher—I’ve found both alive and dead ones in there. Ewwwwwwww! Flies: what can I say about them other than there are lots of them around and they are annoying! They are extremely persistent and generally not phased by our attempts to shoo them away. If they do go away, they come right back. They love to just hang out on food. Mozzies: just like anywhere else, you notice them the most in the evening and in wooded, wet areas. Screens are an essential part of living as is mozzie spray! Fortunately, we usually find them outside, unless someone forgot to close the screen door! “Aussie salute”: what you see someone doing when they’re waving their hands in front of their face trying to keep the flies away. “Bunyip”: from Aboriginal mythology, a dark mythical creature thought to live in swamps or rivers, kind of like a Yeti mixed with Ogopogo or Lochness Monster.